Surprisingly, the retail box of the Samsung Galaxy Note I717 is quite small. Inside, you will find a charger and microUSB cable, as well as the usual booklets. 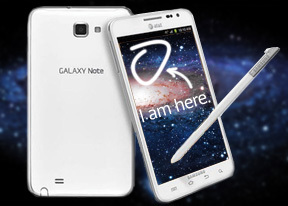 The Galaxy Note's retail package is yet another example of a seriously negative trend, which has begun recently. Too often, we see essential accessories such as headphones and/or memory cards omitted from the retail boxes of the carrier branded devices. We hope this will not be the future norm in the industry. Samsung have never been particularly bold with the design of the smartphones in their U.S. lineup and the Galaxy Note I717 is no exception. The device has ditched the hardware home key of its global relative and looks like a stretched out member of the Galaxy S II family - not a bad thing, we think. The device looks simple, but definitely not understated due to its sheer size. Build quality holds no surprises as well. The device is put together from high quality plastic in order to keep its weight in check. Going heavy on the metal would have simply made it impossible for the phoneblet to sit comfortably in your pocket. The screen is protected by Corning's Gorilla Glass, so scratches are highly unlikely. Speaking of the Samsung Galaxy Note size, there are two approaches to it. Its measures of 146.8 x 83 x 9.7 mm, coupled with 178 grams of weight, qualify the handset as huge by any smartphone standards. If you look at the I717 as a tablet however, the perspective changes completely. It is easier to carry around than any tablet, without (mostly) compromising on functionality. The 5.3" Super AMOLED screen of the Galaxy Note I717 is simply gorgeous. It gives you 800x1280 pixels of infinite contrast and blacks. It can be quite power efficient too - as long as you use predominantly black backgrounds. The benefits of such a display are clear in every aspect of the handset's functionality. Multimedia and gaming are a pleasure, and so are web browsing and typing. You can see our in depth inspection of it here. Below the screen, you will find the typical for all U.S. Samsung Android smartphones four touch sensitive keys. Above the display is where the front-facing camera, earpiece, ambient light and proximity sensors reside. The volume rocker of the Galaxy Note is located on its left side. Using it with one hand is a rather tricky exercise. The power/lock key is located on the right side of the device. A 3.5mm audio jack is located on the top of the I717. A secondary microphone keeps it company. The microUSB port and mouthpiece can be found on the bottom of the device. The 8 megapixel camera lens has the LED flash by its side on the back of the Samsung Galaxy Note. A tiny latch for removing the battery cover resides here as well. The S Pen compartment is in the bottom left corner. We'd like to mention here is that the S Pen itself is rather hard to pull out. It is better this way than being too loose and likely to fall off and get lost. The loudspeaker grille is here as well. There are no surprises under the battery cover of the Galaxy Note I717. There, you will find the beefy 2500mAh battery, along with the SIM and microSD card covers. The Samsung Galaxy Note I717 did slightly better than its global relative in our battery test by achieving a score of 40. This means that we've rated the phone as needing a recharge every 40 hours if you use it for an hour each of phone calls, web browsing, and video playback every day. A different usage pattern will likely change this number, but our controlled test criteria makes it easy to compare to other smartphones out there. 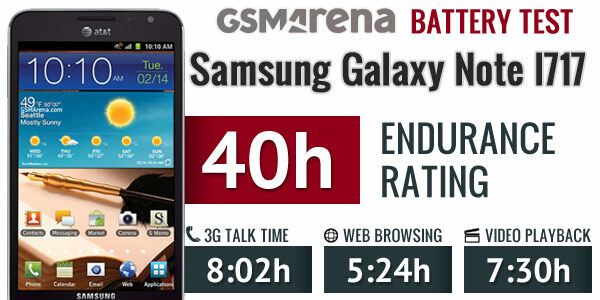 You can get the full breakdown of the handset's battery test performance here. If you end up having the device however, it is likely that you'll use it quite heavily. We easily managed a full day on a single charge, despite keeping the device busy a lot longer than in our controlled battery test. Handling the Galaxy Note takes some getting used to. One handed operation is quite tricky - you are setting yourself up for an unpleasant accident. We will highly recommend that you hang on to the device with two hands when playing around with it. Overall, there were no surprises in the design and build quality of the I717. The device feels solid and ready to take a beating in the hands of a heavy user. Difficult one handed operation is hardly a surprise. It is still an acceptable price to pay for having such a gorgeous screen. We are now going to take a look at the software of the phoneblet. Don't be surprised if things look familiar here - the device is practically identical to the global version, which we have already examined in depth.